First we’ll answer some common questions and then we’ll give you a step by step guide to using Magical Express. Disney’s Magical Express Service Will Help Relieve Stress! Shuttle you to your resort and back to the airport. Deliver your luggage right to your resort room, and back to the Orlando International Airport. Allow you to handle check-in at your resort instead of at the airport. This makes Disney’s Magical Express one of the greatest conveniences of staying on Disney property, and it takes away some of the greatest stressors of any vacation! It will eliminate trying to jockey for position at the luggage belt, having to catch a cab, or even worse – waiting in line to rent a car. All of these worries can be cast out of your mind. Guests staying at most Disney World hotels on property are eligible for The Magical Express! To see a list of which hotels participate in the Magical Express program, visit here. It doesn’t matter if you’re staying with a package or room-only reservation. Either way you’re welcome to use Magical Express. Sorry – If you’re not staying in a Disney World resort, you don’t qualify. Swan and Dolphin resorts as well as Shades of Green do not qualify. Does Disney’s Magical Express have a direct phone number? Yes! You can call the direct number to the Magical Express: (866) 599-0951. Magical Express is actually run by Mears Transportation and you can call them directly with any questions. Can Service Animals and Dogs that are Pets go on Magical Express too? Yes. Service animals are permitted to travel with their owners in the passenger cabin on Magical Express. Disney now has some pet friendly resorts that allow dogs. If you’re staying at one of these resorts, and you’re visiting with a dog that is not a service animal, it must travel in a pet carrier that you bring yourself. The pet carrier has to be able to fit safely on a seat inside the bus for this to be allowed. It’s simple to sign up for this service when making your vacation reservations, either online or over the phone. Or if you have a travel agent, they can do it for you. If you’re phoning, call (407) 939-1936. You’ll need your flight information. What if you’re booking your flight separately and don’t have the information yet? Airline, flight number, arrival and departure dates. What if your flight changes? No worries! Just call Disney and give them the new information. You’ll want to call Disney to have that added to your reservation. If you’re be bringing a wheelchair or ECV, check out our Magical Express page for those with wheelchairs, scooters, ECVs and other mobility devices. If you’re an International traveler, you can have your travel agent sign you up, or you can sign up for Magical Express either by phone, or by using a form on Disney World’s site here. Once you’re done you should get an email from support@disneymagicalexpress.com. It will have your reservation confirmation information and instructions for preparing. If your luggage tags and MagicBands don’t arrive in time, you’ll still be able to use Magical Express. We’ll tell you how below. Step 3: When You Fly to Disney World, Here’s What You Do! keep your MagicBands and Magical Express Documents with you in your carry on. You’ll need them before you get your bags. Check your luggage at your airport. Tip: Don’t pack your MagicBands in your checked luggage! You’ll need them to check in for the Magical Express, and to use as a key to get into your room when you arrive at the resort. If you don’t have a MagicBand, you’ll need your Magical Express documents to use the service. You can then get your MagicBands when you arrive at the resort. As long as your flight lands in Orlando between 5:00 AM and 10:00 PM Eastern Standard Time, this can be the last time that you see your luggage until you’re nestled in your hotel room! However, please keep the luggage claim ticket given to you by your airlines, just in case something happens in transition. If you don’t arrive between 5:00 AM and 10:00 PM Eastern Standard Time, you’ll need to pick up your own luggage. When your flight arrives at Orlando International Airport, you will board the train tram that takes you to the main terminal. This is all on Level 3. Baggage claim is on Level 2, but it can be bypassed as long as you arrive in the 5:00 AM to 10:00 PM window. If you’re not within that window, you’ll have to stop by the baggage claim area and pick up your luggage. Once you get to the resort, the Disney Cast Members should still be able to deliver your luggage to your room. If you are within that window of time, Disney will pick up your bags and deliver it to your hotel room. If you arrived on Side A of the airport, go over to side B. Head over to the Magical Express Welcome Center which is located on Level 1 on Side B. Follow the signs to the Magical Express Welcome Center (which is all the way down to the right), making sure to have your MagicBand and paperwork out. If you didn’t use Disney luggage tags, give a Cast Member your baggage claim numbers. The Disney Cast Members will direct you to your line where you will await your Magical Express bus to your resort! Your MagicBand should have all your information on it for the Magical Express. However, if they don’t or for some reason you did not receive your MagicBands, proceed to the check-in desk with your paper documents. The Disney Cast Members will direct you to your line where you will await your Magical Express bus to your resort! If for some reason you didn’t receive your papers either, they should still be able to assist you if you have a Magical Express reservation. If you’ve already changed planes inside the USA, and you’ve gone through Customs at a U.S. Immigration checkpoint, you can head over to the Magical Express Welcome Center. If Orlando is your first stop inside the USA, once you get off the airplane you’ll go through the U.S. Immigration checkpoint. You’ll need to get your luggage. You’ll also need your passport and any other documents that are required. Once you’re done with the Immigration checkpoint, if you want to allow Disney to deliver your luggage to your room and it’s between 5 AM and 10 PM Eastern Standard Time, return your checked luggage to the transfer carousel. Disney should get your luggage and deliver it to your room. If it is between 10 PM and 5 AM, You’ll have to get your luggage and bring it with you to the Magical Express Welcome Center. Now follow the directions for the non-international guests above to get to Magical Express. It will take time for you to arrive at your resort. The buses are pretty comfortable with individual padded seats. Each bus will stop at multiple resorts, so the journey will take roughly 35 minutes to an hour. However, we find that the trip doesn’t seem very long due to videos played on the bus and the aid of great bus drivers! Children are allowed to sit on adults laps or in their own seat. Car seats are not permitted on the bus, but the Cast Members will store it below for you. Your luggage will usually arrive in your room within three hours, but Disney suggests keeping any medication, essential items and/or valuables in carry on luggage. We strongly advise that as well. Be sure to keep anything with you that you may need. Some people even like to carry bathing suits so you can go swimming at your resort before your luggage arrives! Now that Disney has taken care of the luggage and transport hassle, you’re free to enjoy your vacation! Disney will inform you of when your return trip to the airport is scheduled by placing a Transportation Notice on your hotel door or sliding it under the door. 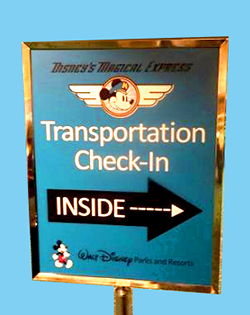 You’ll need your Transportation Notice before boarding Magical Express. It will be collected by the Cast Member there. MagicBands hold no return trip information. Return trips on the Magical Express are scheduled to depart your hotel about 3 hours prior to your flight. It was 4 hours previously but beginning January 11, 2018 it’s 3 hours. International flights may be scheduled 4 hours before your flight. If you need Bell Services to take your luggage, you’ll have to call Bell Services to arrange it. Otherwise you can bring your luggage to the Magical Express bus area yourself. You will be responsible for transporting and checking your luggage on the way home, UNLESS you are able to utilize the Resort Airline Check-In (read below to see if you qualify). If you can’t use the Resort Airline Check-In Service, your luggage will be loaded onto the Magical Express with you, and you will be responsible for checking it in at the airport. Either way, you’ll want to either contact valet to get them to deliver your luggage, or you’ll take it yourself. If you’re using Airline Check-in, you’ll have your luggage delivered to that desk. If you’re not using it, you’ll have your luggage delivered right to the Magical Express bus. You’ll report to your Magical Express bus by your assigned time. Actually the time you’re given is the time the bus will leave, so you’ll want to get there at least 15 minutes ahead of time. Again, be sure to bring your Transportation Notice, and any other documents you’ll need. Please be aware that the bus may be taking guests staying at multiple Disney resorts. This may extend your travel time. For those with mobility issues, in wheelchairs, scooter and ECVs, check out the Magical Express boarding information here. On your bus ride to the airport, the Magical Express will play a good-bye (or see ya real soon) video on your way to Orlando International Airport and before you know it, you will be at the airport ready to head home! No taxis, no returning a rental car, no getting lost without your GPS. Magical! This service allows you to handle the airline check-in at your resort so you can bypass the airline check-in in the airport. You’ll check in for your flight, print boarding passes and check your luggage. The Resort Airline Check-In desk will be somewhere inside your resort lobby area, or outside near Bell Services. The Resort Airline Check-In is available at the majority of Disney World resorts. 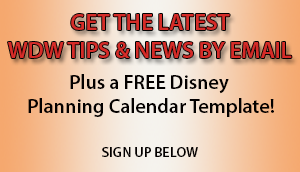 To see a list of the resorts that qualify, visit Disney’s page here. If your airline is participating, Disney will get your luggage checked with your airline, allowing you to skip this line yet again! – If you’re not using one of the airlines listed above, you can still use Magical Express transportation, but you won’t be able to use your resort check-in service. You’ll have to handle check-in with your airline at the airport. – Anyone staying at the participating Disney resorts can use the airline check-in to get their boarding passes, even if they’re not using Magical Express transportation. However you must be using the Magical Express transportation if you want Disney to handle your luggage to and from the airport. – You are responsible for any baggage fees. (Disney isn’t THAT magical). To pay for your airline baggage fees: Pay by phone by calling Baggage Airlines Guest Services (BAGS) before you go to your Resort Airline Check-In Service. They currently take MasterCard, Visa, American Express and Discover. You’ll be paying any baggage fees your airline would normally be charging you. Fees vary by airline. Only guests who are using the Resort Check-In Service can pay for their baggage fees in advance. It’s free to call from your Disney World resort room. Call BAGS (407) 284-1231 between 7 am and 11 pm Eastern Standard Time. If you’re luggage is greater than 50 pounds. If you have more than one bag per person. If your bags don’t meet the size or weight requirements for your airline, and you didn’t pay your additional fees in advance of your flight. If you get to the Resort Check-In Service within 4 hours of your flight (this may be changing to 3 hours – please check in advance). If your flight leaves before 8 am. Naturally since your Magical Express departure time should be about 3 hours prior to your flight, give yourself plenty of time to handle the Resort Airline Check-In Service and to pay baggage fees. What if I don’t know my flight information? Do not worry! – Magical Express can be arranged at any point prior to your trip. What do I do if my flight information changes? If your airline has been a tad crafty and changed your arrival or departure time, there is nothing to worry about. Just make sure to call Disney to update them. Your travel agent can book Magical Express for you, or you can book it yourself by requesting it when you make your reservation either on the Disney World website or by phone (407) 939-1936. Upon completing the online form you will receive an email from support@disneymagicalexpress.com confirming your reservation and providing detailed information regarding what you are required to do before-hand. Luggage Tags: Once you book Magical Express, Disney will mail you luggage tags approximately 2-3 weeks before your arrival date. You’ll attach them to your luggage so that it can be collected by Disney’s Magical Express Cast Members, and sent to your room. If you don’t receive your luggage tags in time, and you’re arriving between 5 AM and 10 PM, you can give the Magical Express Cast Member your baggage claim numbers instead. If you’re be bringing a wheelchair or ECV, you’ll need to let Disney know when you make your Magical Express reservation. Not every bus is set up to accommodate wheelchairs/ECVs, so it’s really important to let them know in advance so they can bring an accessible bus. 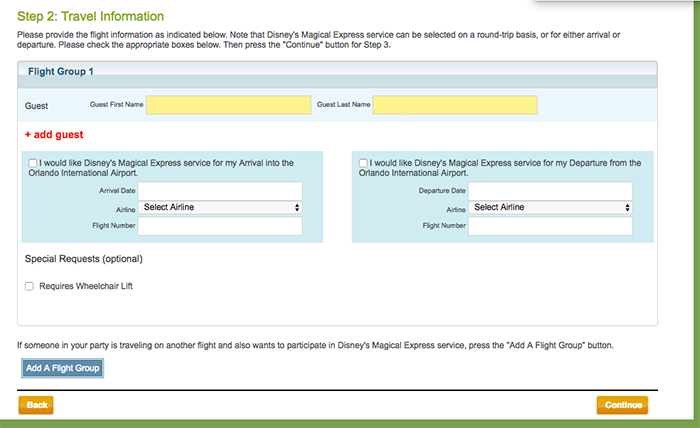 If you’re booking Magical Express yourself, Disney will offer this option during the booking process. If you’re using a travel agent, be sure they know that you need to inform Disney. Personally I think it would be wise to just give them a call and confirm this over the phone as well. 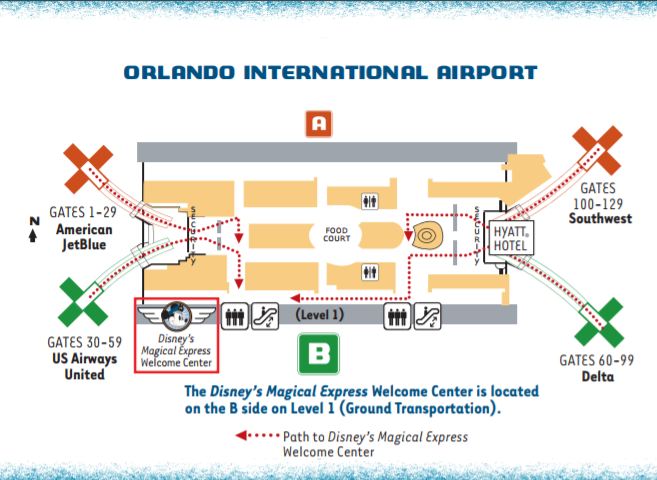 Specific directions for where to go inside the airport after you land are here on Disney’s Magical Express page. Here’s a great perk of the Magical Express. Once you get through security you can bypass baggage claim and jump straight onto a well air-conditioned bus. By staying at select Disney hotels you can get from the airport and straight to your room and choose to have your bags delivered directly as part of the service. Luggage Delivery – What happens at the airport? Always make sure to keep any essential items such as medication and valuables with you just in case. Luggage Delivery for arrival between 5 AM and 10 PM: Your baggage will be collected from your airline and taken separately to the resort as long as it has a Magical Express tag on it, or as long as you’ve given the Cast Member your baggage claim info. Luggage Delivery for guests who arrive after 10 PM and before 5 AM: You can can still use the luggage delivery service but you’re required to collect your own luggage and bring it directly to the designated Disney’s Magical Express area. Once you get to the resort, Cast Members there should be able to deliver your luggage to your room. “We opted out of luggage delivery. Why? I personally am very wary of handing over my luggage like this just in case it gets lost. I’ve heard some terrible horror stories and I am sure the service is great but I am just never prepared to take that risk. If this is something that would also worry yourself, you can simply collect your baggage and take it directly to the bus. They will then place your luggage in the relevant storage compartments underneath. What if I am coming from the UK and do not have my Magic Band? You simply need to present all Disney Magical Express documents to a Cast Member. Where can I find Disney’s Magical Express? It is very well signposted within the airport. It is located on Level 1 of the B-side baggage claim area. So how magical is Disney’s Magical Express? As far as bus journeys go it is very pleasant. Seating is comfortable and the Cast Members were really friendly. You get to watch a video on the various TV screens, which provide some tips on making the most of your time at the Walt Disney World Resort as well. On our bus, there were at most 5 groups, so there was plenty of room. As everyone is so excited to get to the most magical place, there is a really great atmosphere whilst riding to the resort. We also only had a few stop offs before ours and the time flew by. I actually enjoyed counting down each hotel we needed to stop by before our own. It is a complimentary service available to guests and you are not required to pay extra for it. It was such a relief that we would not be required to pay for additional transport once in the United States, potentially spending a lot of money on a taxi or other transportation services. Quick side note, there are also restrooms on the bus if required. Not much more to say on that one. Something to consider would be tipping members of staff who are handling baggage as well as the driver. Of course this is not compulsory but I have noticed some members of relevant Walt Disney Facebook groups ask about this. There is of course no rule, but $1/$2 per bag would be fine and giving the driver something can also be a nice thing to do. Can everyone use Disney’s Magical Express? For guests who are travelling with children, children are allowed to sit on an adults lap or occupy their own seat. Car seats are not permitted on the bus and must be stowed away. For those using a wheelchair, the driver will be the one who will assist in getting you onto the bus. When on the bus, they can take up to four wheelchairs in one trip so if there is more than one member in your party using a wheelchair you will not be required to be split up. If for any reason you have not been able to inform them regarding the use of a wheelchair, please inform a Cast Member as soon as possible and they will do their best to get you on the next available bus. From what I have read the key to using this service with a wheelchair is just to simply keep the Magical Express team informed and the entire process should run smoothly. Those using a wheelchair are escorted to a waiting area and there is a seating area if required, with a Cast Member waiting by willing to answer any questions you may have. Upon doing some further research I also learnt that service animals are also permitted to travel. However, no other pets are permitted. What if I do not want to use Disney’s Magical Express? Ok so I have only experienced this once as I have only stayed on Walt Disney World property once. But if I stay on property again I definitely wouldn’t. Saving money for a Walt Disney World trip can be a key feature for most, so why turn down a free service? People may argue that it isn’t free, as you have technically paid for it within your booking, but it at least feels free. So why may you want to not use the service? I suppose some people may prefer to be driven in their own vehicle, or would rather not wait in line or have to stop at the different resorts, however I experienced no inconvenience. It could be argued that using the service does cost you some time. It can take from anything to one to two hours from getting through security to getting to your hotel. Even in a best-case situation, it will take longer than picking up a rental car and driving yourself, or using an external transportation company to drive you there. Despite being able to rent a car we didn’t want to do so. Additionally, despite all the advise out there I am sure we could have found a great alternative, but I just did not see reason to. As we were coming from the UK, we were in no rush to get in the park especially as we did arrive much later in the day. We didn’t have to wait too long for our bus, and once it arrived we boarded it so quickly. Like I said earlier, there were not many people on our bus so that definitely made it easier. But even on the way back, with over half the bus full, it was still a very easy process. For those who are going to pick a car up from the airport can simply drive straight to the resort. However, those collecting from the Disney Car Care Centre can still make us of Disney’s Magical Express. My cousin and her party did exactly this. She personally said that upon landing in Orlando and then having to try and organise getting into a rental car as well as driving somewhere they do not drive regularly could be a stressful ordeal. This is where convenience is key for Disney’s Magical Express. As they rented the car from the Disney Car Care Centre they were able to arrange a free of charge collection from their resort the next day, in which they were collected and taken to the Car Care Centre. This needs to be arranged with your resort and it would be advised to arrange this the day before, or at least two hours before you want to collect the car. This way they were still able to get to their resort stress fee by using Disney’s Magical Express and then deal with the car rental the next morning. When it comes to returning the car you simply need to take the car back at the arranged time and they will again drop you off anywhere on property. This of course is irrelevant if you have not rented a car via the Disney Car Care Centre, but if you have, you can still make use of Disney’s Magical Express service and have a stress free ride to your chosen resort. Moving on to the sad and tragic time when you have to depart from Walt Disney World, it is time to board Disney’s Magical Express once more, or what my cousin liked to call it the Tragical Express. The day before you are required to checkout you will receive a Disney’s Magical Express Transportation Notice with the pick-up time and location. It is a true sign that your trip is almost over. Pick-up times are scheduled approximately three hours prior to your flight departure time for domestic flights and four hours for international flights. As we had a later flight, our pick-up time wasn’t until around 3pm so we had plenty of time to spend a few last moments in the parks. Whilst staying at the Caribbean Beach Resort we checked out and placed our suitcases within a luggage room. I would advise checking with your resort where the luggage room is based compared to your own hotel room as it may be a fair distance and you may want to arrange for them to be collected by a Cast Member. By doing this it meant we were able to walk freely around the Magic Kingdom on our last day. From personal experience, I would arrive at least half hour before your pick-up time. It just allows you some time to sort yourselves out and get ready to board the bus. It’s key to realise that using Disney’s Magical Express doesn’t mean you can’t rent a car. The benefit of using it is mainly for its convenience. You literally get off the plane and hop straight on. It is such a smooth process. I think for many as well using Disney’s Magical Express becomes a really big part of their trip. It can become as big as a tradition as having to ride It’s A Small World. It really starts off your holiday. If you have never used it before, it may sound a tad complicated, but it is really easy to use and I would say it is very stress free, which is all you want when you have just come off a flight. It is a really good service and fun way to start of the holiday. It feels Disney. This way they were still able to get to their resort stress fee by using Disney’s Magical Express and then deal with the car rental the next morning. When it came to returning the car you simply need to take the car back at the arranged time and they will again drop you off anywhere on property. This of course is irrelevant if you have not rented a car via the Disney Car Care Centre, but if you have, you can still make use of Disney’s Magical Express service and have a stress free ride to your chosen resort.